Wrist-Aid was investigated in a clinical study in 2016 (ClinicalTrials.gov ID NCT02534493). Participants wore Wrist-Aid for 8-10 hours daily for 4 weeks. Severity of their carpal tunnel syndrome (CTS) symptoms was evaluated at 2 and 4 weeks into treatment, and then 2 months post-treatment. The Symptom Severity Scale grades the patient’s symptoms on a 1 to 5 scale, with 1 being no symptoms and 5 being the worst symptoms. 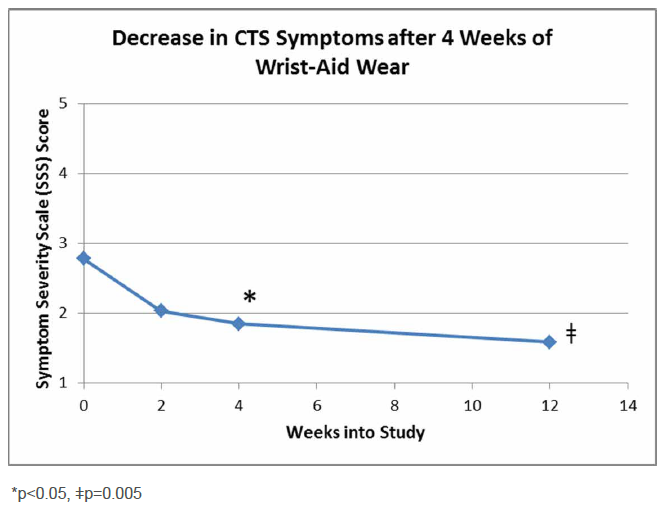 Symptom severity for participants with unilateral CTS decreased significantly by 0.9 points after 4 weeks of wearing Wrist-Aid and continued to decrease significantly by 1.2 points two months later. Sign up for updates below if you would like to be notified of future research trials.